I have been planning to make a panettone this year, and I was delighted when I saw in Daring Balers foroum that the challenge was this famous Italian sweet bread. Plus I loved how special the bread is made and knew if I tried this recipe it would be delicious and I was not wrong, we loved them at home. I did half the recipe from below. I especially did that as I could give two away as presents for my inlaws. 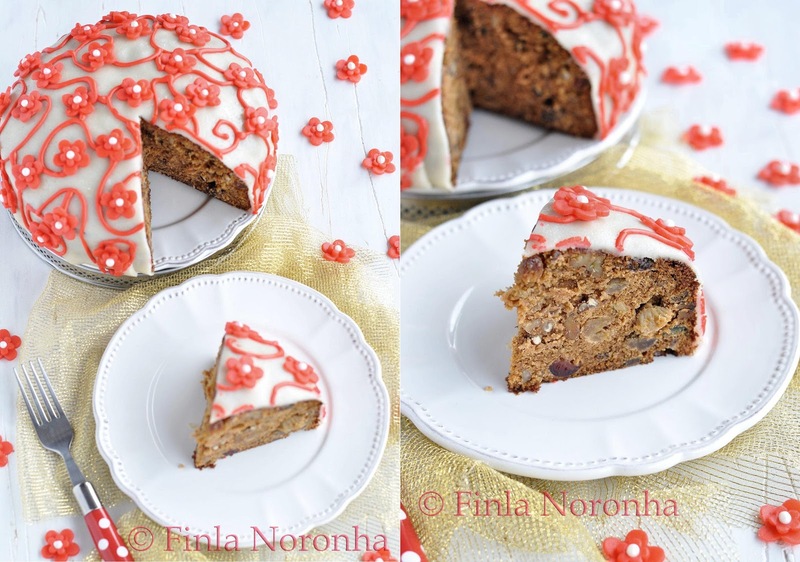 The December 2012 Daring Bakers’ challenge was hosted by Marcellina ofMarcellina in Cucina. 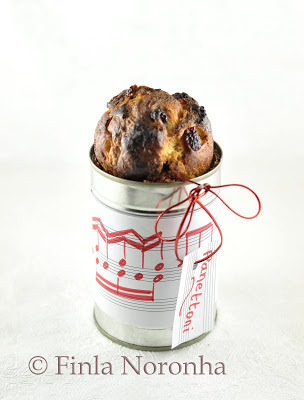 , it is a traditional Italian holiday bread. 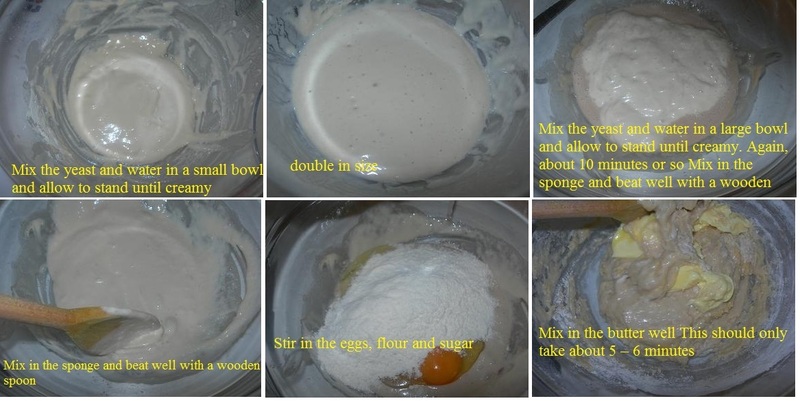 Mix the yeast and water in a small bowl and allow to stand until creamy. That’s about 10 . I mixed the fruits miw with orange liquour and did everything for 1 to 2 minute in the MW.. In the recipe there was a special method they used for cooling the bread which I didn't do as I didn't get it , so i just folded two dry kitchen towels and them kept the pannotni on top and every 10 to 15 minutes I turned . Labels: Baking, Bread, Christmas Baking, Daring Bakers, Home Made Christmas Gifts. 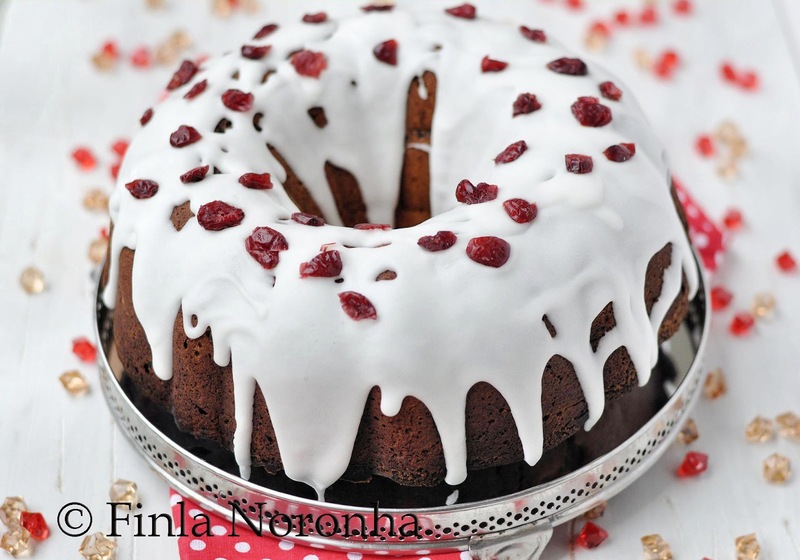 I remember I used to love christmas cakes, the one we got from Kerala Bakeries and the one mom always made for christmas. But to be honest now I am not a huge fan of Christmas fruit cakes. And that goes to the rest of my bunch. But I on the other hand always get nostalgic during this time to make one and I end up making them. Plus point is I take the cake to my inlaws place to be shared. 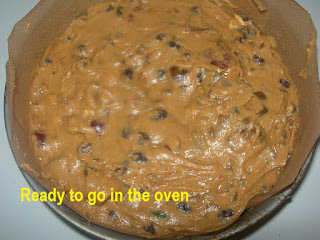 Ok I know it is early for the cake as christmas is not there yet, but as traditionally on christmas day we go to my inlaws place and MIL buys from the pastry shop a christmas log, so as I am nostalgic every year for making the fruit cake , I make them ahead which I did this sunday and took to their place for coffee. 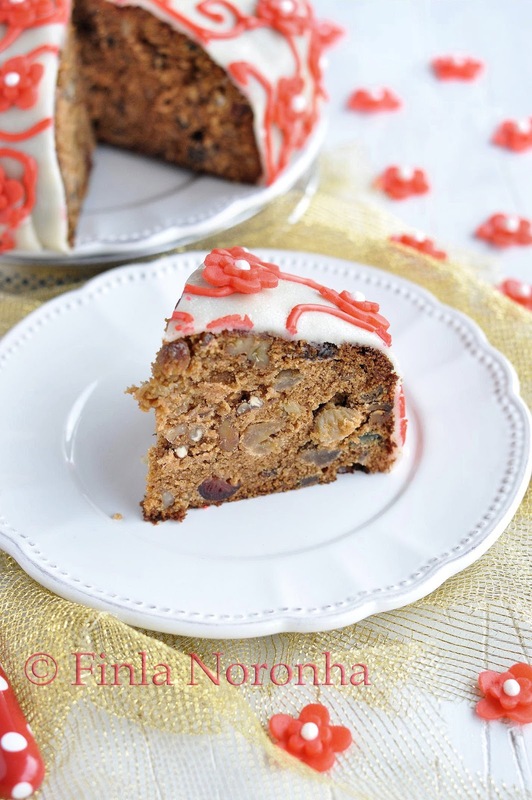 I used the same recipe which I use every year, but this time I added different dry fruits and nuts and i played around with the spices as Hans din't like 5 spice powder. 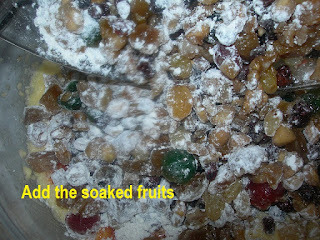 Dry fruits 450 gm ( I added raisins,prunes,apricot,crystalized ginger,cherries,walnuts,almonds) all cut in small pieces. 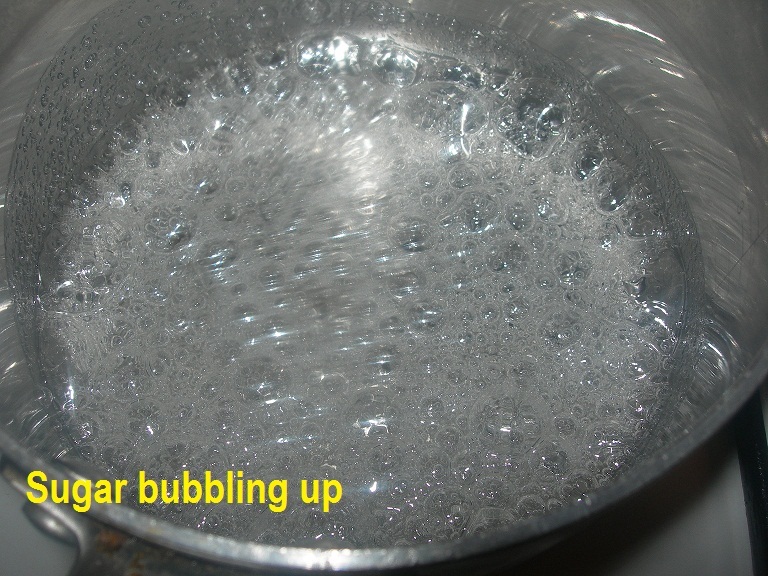 Mix the above ingridients and keep in a sterilized bottle for at least a week. The decoration is not a must you can serve the cake just without it. But I love decorating the cake. So what I did was dcovered the cake with shop bought marzipan for covering the cake. Made a paste of powder sugar, egg whites and red color for drawing the red lines etc... plus added some red color to a bit of marzpaan but oir flowers for the decoration. 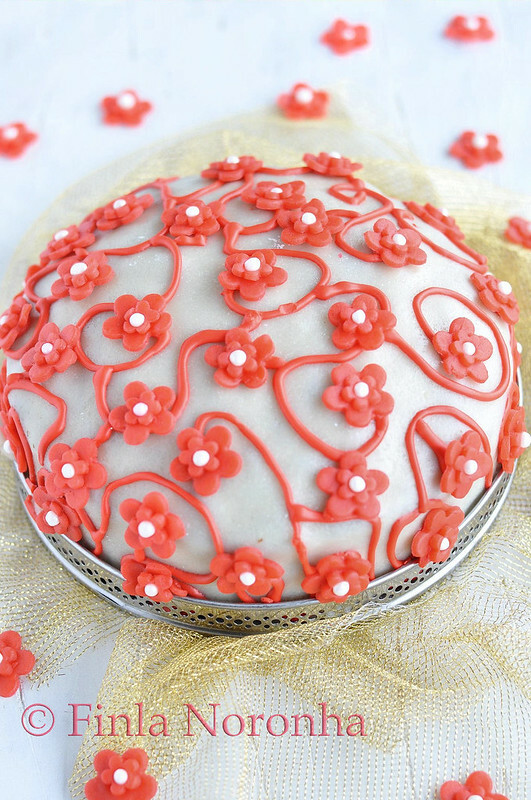 You just have to go with your liking how you want you cake to be decorated. Grease and baseline a 20 cm springform tin fitted with a flat base. Cream the butter , sugar, vanilla till they are fluffy. 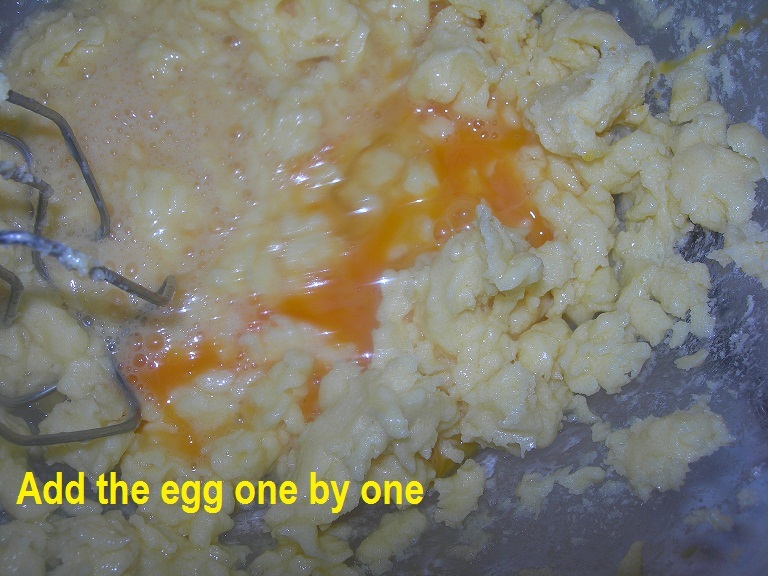 Add then eggs one by one and beat each time. Now to this mix add the flour, baking powder, soda bi carbonnate, and all the spice powder and then carmel water and molases. 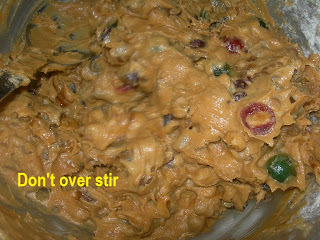 Don't beat the mixture too much just fold in till everything is mixed well. Now to this mixture add the rum soaked fruits and fold gently. Bake for 1 hr and 30 minutes or till the cake is baked. I keep the cake for atleast a week before i decorate with marzipan . The taste seems to get better if you keep them for maturing for at least a week, If you have more time do that. 1 tbsp water plus 1/4 cup water. 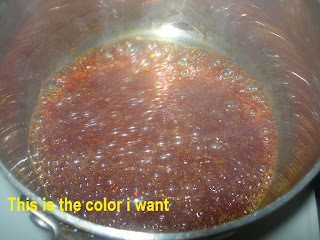 Don't stir with a spoon just swril the pan when it melts and when it reaches the caramel color you want, take the pan off from the fire and take it to the zink and then pour the 1/4 cup of water and mix everything well. Only use the carmel in the cake when it is fully cool. 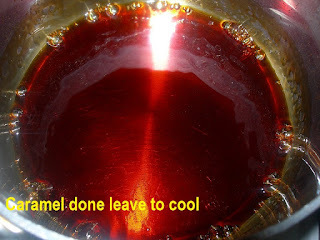 Take care when you make the caramel as you can easily burn yourself with the melting sugar. The weather is getting colder day by day , last night I could hear that the heating system was automatically (when we go for sleep we regulate the degrees and if the living get colder then it goes on) going on as it must have been so cold in the night. Not that I can complain as I am tucked comfortably in the warm bed. But I am a light sleeper and when the heating systme goes on it make a kind of noise. Sis , No I am making Kalkus ( it is a sweet made with flour, egg, and fried and then coated with sugar syrup etc...then she says after this I am aslo going to make Diamond cuts, yet another sweet which is made in kerala during the holidays. I ofcourse so Jealous wish i could make all these things , I want to, but I can't as no body is going to eat them and I will be the one ending up eating all this sweet things. 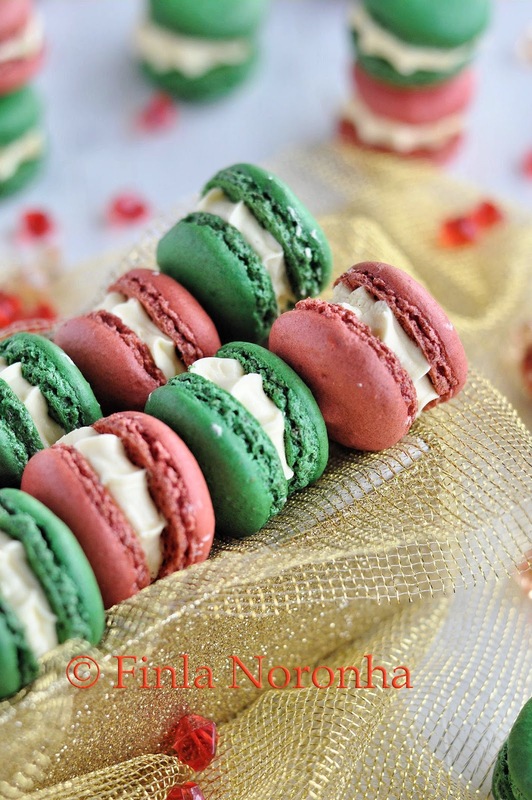 One of the first baking website love even before I started my blog is Joy of Baking, I know if you love baking you won't be a stranger to this site. I think the whole word knows about it as it is so good, I have made so many bakes from there and it always comes out perfect. 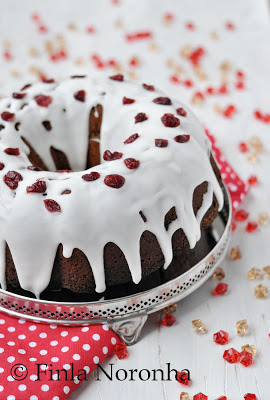 And this Lemon Cranberry Pound Cake was no different too. I have made this cake so many times but I have never blogged about it, and this time too I was not planning to blog hence no step by step picture, but then as it was looking so christmasy I thought why not. 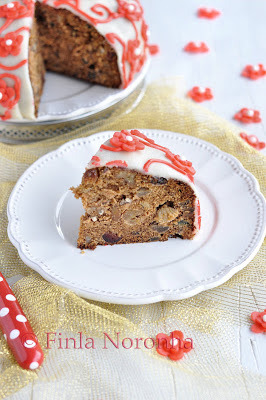 It is such a easy cake to make and really moist and so delicious. 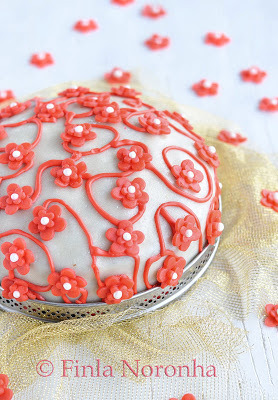 Do check the original post as there is lots of tips for making this cake. 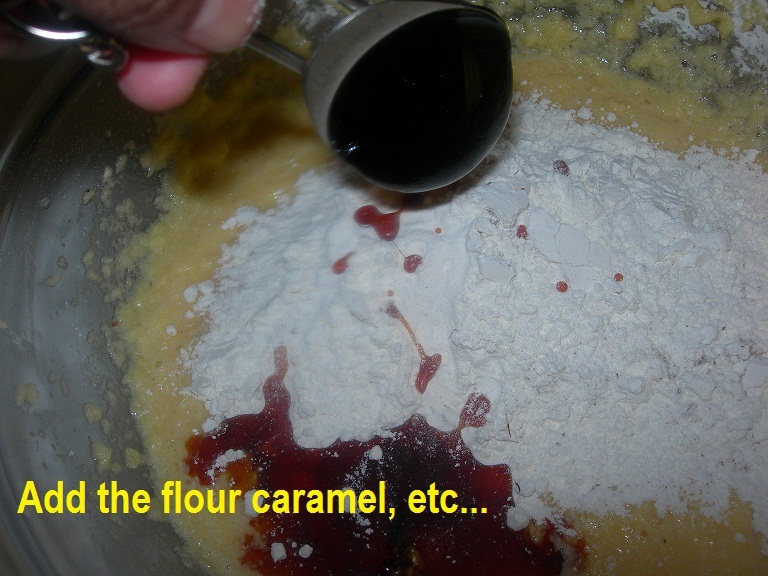 Do this step first before you start with your cake mix. Preheat oven to 350 degrees F (180 degrees C). Butter and flour (or spray with a vegetable oil and flour spray) a 10 inch (25 cm) bundt pan. 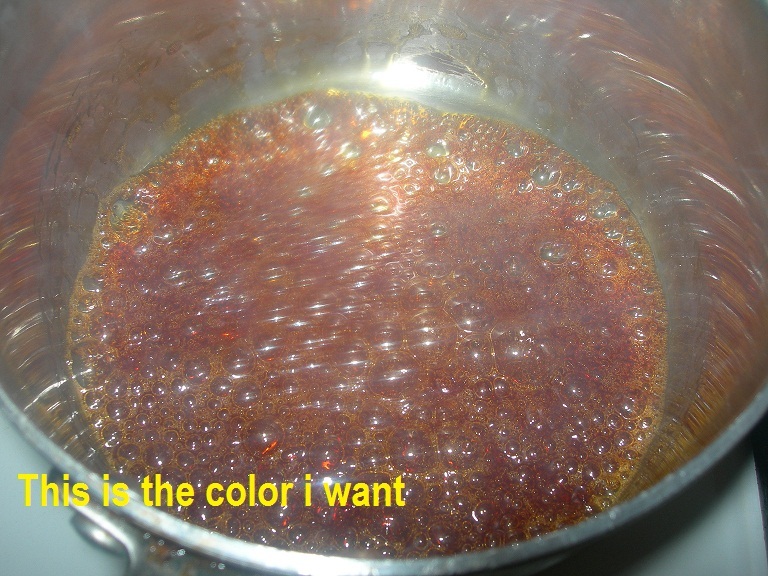 If using a dark colored pan, reduce the oven temperature to 325 degrees F (165 degrees C). 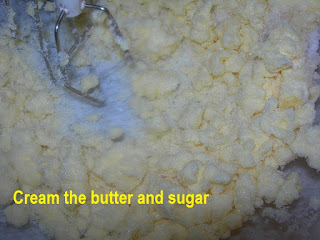 In the bowl of your electric mixer, or with a hand mixer, beat the butter and sugar until light and fluffy. 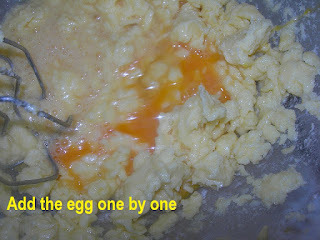 Add lime zest, vanilla extract and eggs, one at a time, beating well after each addition. Scrape down the sides of the bowl. With mixer on low, add 1/3 of flour mixture, alternating with the sour cream, about 1/2 cup at a time, beating just until batter is smooth. (You will have three additions of flour and two of the sour cream.) Stir in the drained cranberries. Pour batter into bundt pan and smooth the top. Bake for approximately 60 - 75 minutes or until a toothpick inserted into the middle of the cake comes out with a few moist crumbs. Remove from oven and place on a wire rack. Let cool 5 minutes and then lightly brush the top of the cake with half of the reserved cranberry liquid. After 10 more minutes loosen sides of pan with a sharp knife and invert onto a wire rack. 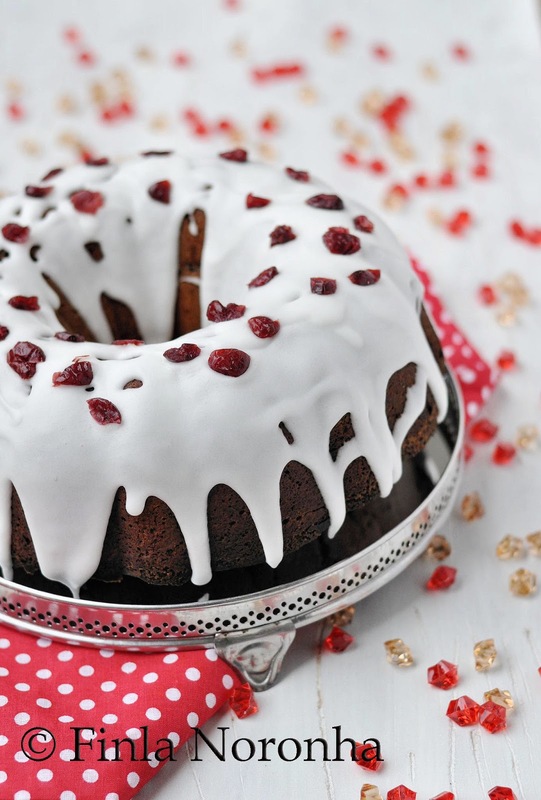 Immediately brush the top and sides of the cake with the remaining cranberry liquid. In a bowl, combine the sifted confectioners sugar, table spoons of egg whites ( add first 2 tbsp of egg white and then if you want more add more) with the orange liqueur . I wanted to have a real thick frosting than in the recipe. Spoon the frosting over the top of the cake, allowing the icing to drip down the sides. 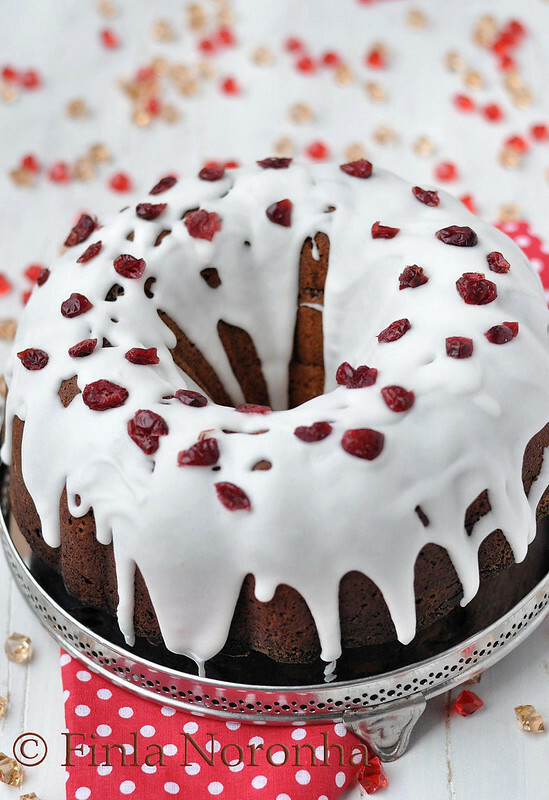 I also decorated with some extra cranberries on top too. 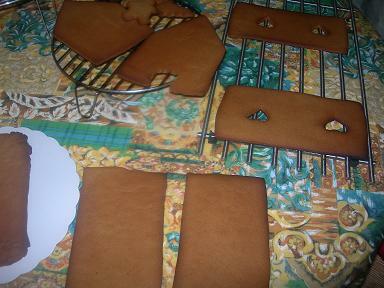 Let the icing dry before covering and storing. 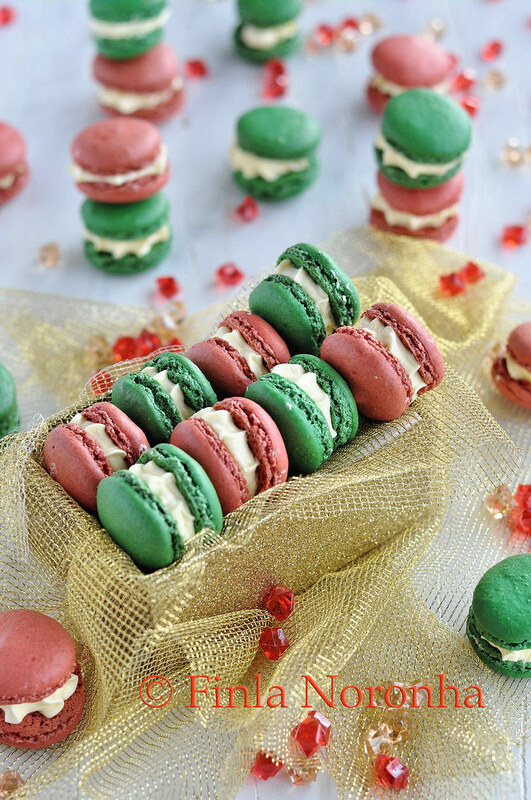 I don't know if I really love to eat macarons, I do eat them when I have my coffee as it is a habbit of us here when have a cup of coffee we will have a biscuit, cookie, chocolate etc....not that it is a must but we do that. In my early macaron making time I did eat them even though I think macarons are really sweet, but now after making macarons so many times the excitment is not same as before. Every year this time of the year I always think of making macarons with christmasy colors, but then there are so much things to do around this festive time, it never happens. I always stick to my Ottelonghi book, which till now has not failed me. Meanwhile preheat the oven to 150C (the original recipe has 170C). Bake in preheated oven for about 17 to 19 minutes. They are ready when they readily leave the paper when liften with a palette knife. Remove from oven as soon as this happens, and leave to cool completely. Add the Advocaat to the buttercream and fold with a spatula until fully incorporated. I don't know from were the orgin of this recipe is from, I know it is a very known dish in Belgium. Maybe I should have asked Hans more about it before he went for work and now it is too late as I had promised my sister I will post the recipe today. She has been asking me for this recipe for so long. Every time I made the dish I didn't take a picture , I told her I have taken the step by step pic how to make them and I know I had taken them but I don't find them in any of my maps and I looked but it is not there. And I know she likes it when I put the step by step pics and if I had known I had losted the step by step pics, I would have taken the pictures of making them when I made this sepcially for posting here yesterdey evening. The recipe is for 2 person, When i serve this as a main dish as I did yesterday, then I give some 8 scampi's per person, if you are giving this as a starter you can give 4 scampi per person. Tip: If you think your sauce is a bit runny you can thicken it up with a bit of corn flour and water mix in the end. I fry the scampis for 1 1/2 minutes each side and then combine together with the bubbling sauce and give a stir or two so the scampis are fully cooked. 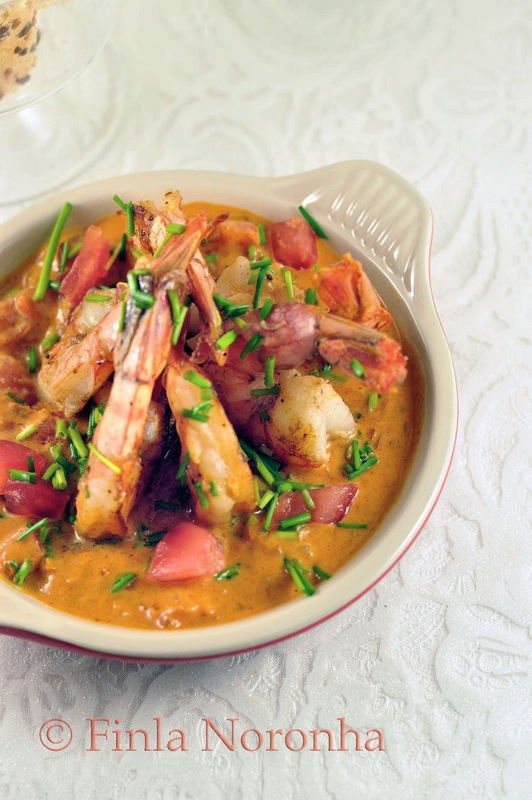 Don't over cook the scampi's nothing worse that eating overcooked rubbery tasting scampi's. I also keep few chopped pieces of tomatoes and a table spoon or two of the chives to sprinkle on the top of the dish when I serve the dish. Add the oil in a pan and when it is hot add the shalots fry for few minutes ( glaze them don't color them) Add the garlic puree fry for a minute or two. Add the Ketchup and give it a good mix. Add the cream to the pan and in the mean time heat a griddle pan , add the knob of butter and fry the scampis for the minutes mentioned above. When the sauce is fully bubbling up check it is too think if it is add alittle corn flour and makes the sauce thick. Now add the tomatoe pieces and the chives and the fried scampis and give a good mix so everything is totally heated up. Cheeck for salt and peper. 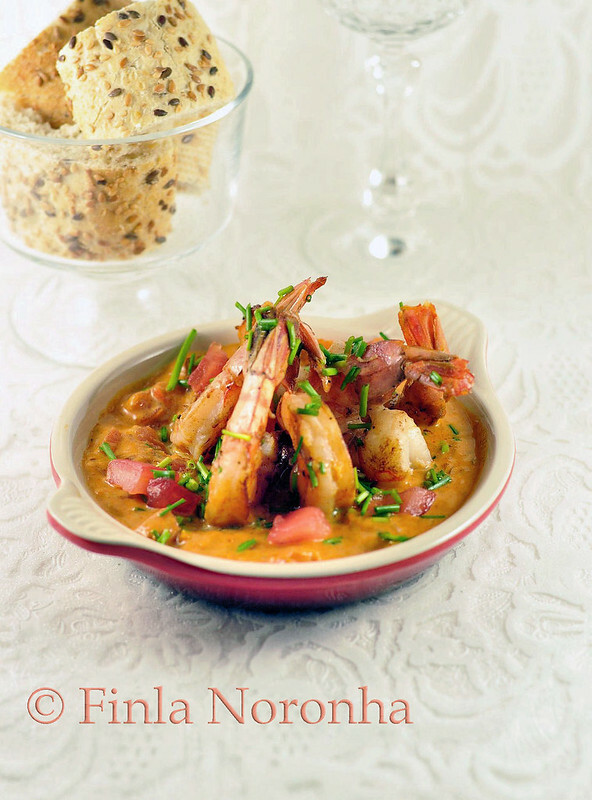 Serve with a sprinkling of cubed tomatoes and chive. 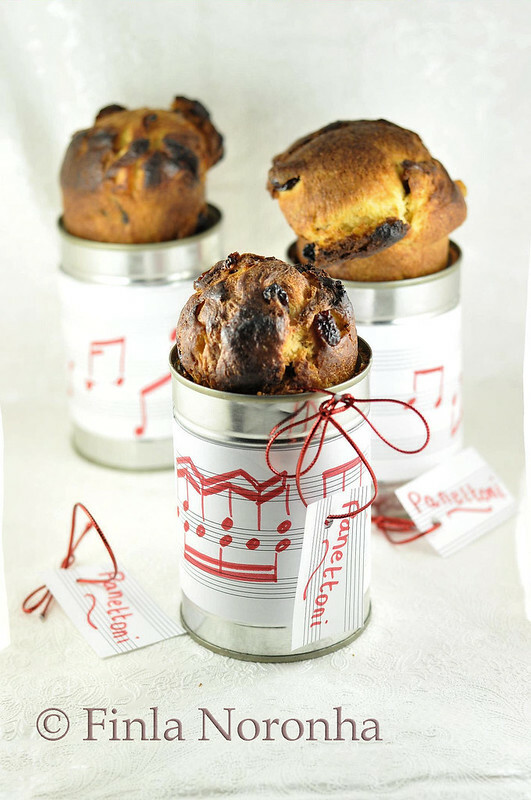 Enjoy them with bagutte especially to scoop up all that delicious creamy sauce. I have always wanted to make a Ginger Bread House. And if i say always I mean for years, around every Christmas I will be like this year I will make one, but then I will be busy and the christmas season will be gone and then I will say to myself and my family well I will make next year then. 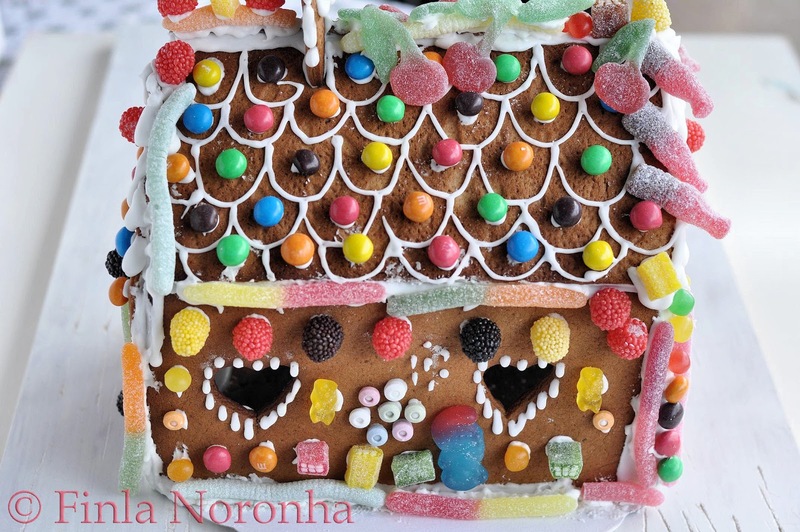 I must have told every year that I want / will make a ginger bread house, that even Shyama knows that is something I find beautiful and I want to make. So the first year Shyama was in College ( the city she lives has this beautiful baking / kitcenware store, which I always go when ever I visit her) so as she knows her mom likes baking she went to this shop for looking for a New years presents and she saw the cutter to make Ginger bread house and that was one of her gifts for me for my New years from her . And this happend in 2009 and two chirstmas came after getting the present and I didn't use them. I must say I had so much fun in making them and I loved doing all the sweet decorations, I was like a small child. In my town there is a famous pasty shop and their bakes are so delicious and so good. Every year during this season they start selling these ginger bread house and me naturally always watch their collection when I pass. So i will be outside the shop window watching :-) together with other people who passes by as everybody stop there and watch these beautiful houses. They all say wow it is beautiful but then they also remark it is very expensive isn't it for 32 euros and the houses are half the size or more less of the house I made. Gingerbread is a sweet food-product flavored with ginger and typically using honey or molasses (treacle) rather than just sugar. Gingerbread foods vary, ranging from a soft, moist loaf cake to something close to a ginger biscuit. The different types likely share a common origin. I didn't had to use their template as I had one here at home. And I have give the decoration idea they have given but as you can see you don't have to stick to any particular decoration you can decorate accodring to your liking. The recipe for the Ginger Bread is from BBC Good Food. I would have taken more pictures how to make them, but mt hands were sticky Ididn't want my camera getting stickt too. 1.Heat oven to 200C/fan 180C/gas 6. 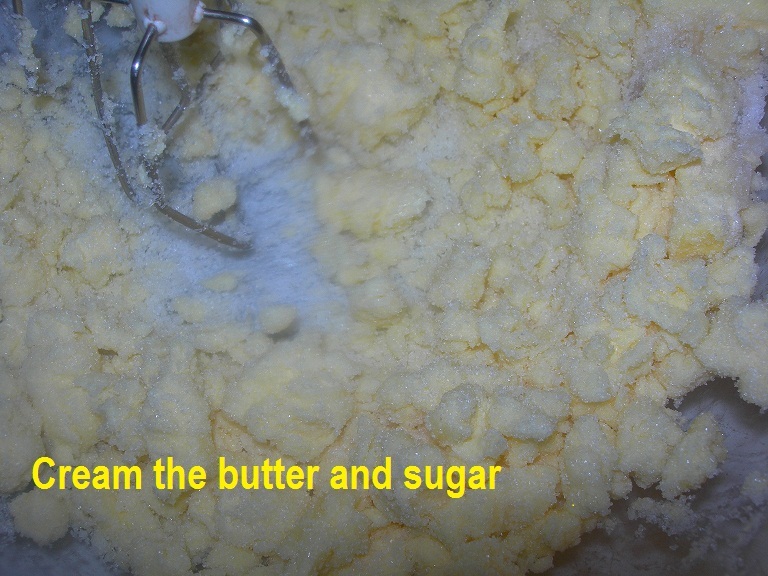 Melt the butter, sugar and syrup in a pan. Mix the flour, bicarbonate of soda and ground ginger into a large bowl, then stir in the butter mixture to make a stiff dough. If it won't quite come together, add a tiny splash of water. 2. Cut out the template (see below to download). Put a sheet of baking paper on your work surface and roll about one quarter of the dough to the thickness of two £1 coins. 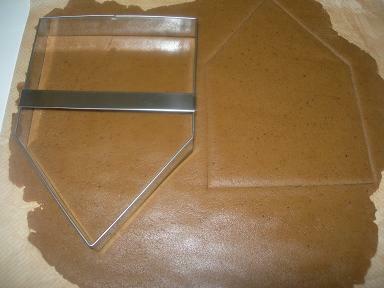 Cut out one of the sections, then slide the gingerbread, still on its baking paper, onto a baking sheet. Repeat with remaining dough, re-rolling the trimmings, until you have two side walls, a front and back wall and two roof panels. Any leftover dough can be cut into Christmas trees, if you like. 3. Pick out the most intact flaked almonds and gently poke them into the roof sections, pointy-end first, to look like roof tiles. Bake all the sections for 12 mins or until firm and just a little darker at the edges. Leave to cool for a few mins to firm up, then trim around the templates again to give clean, sharp edges. 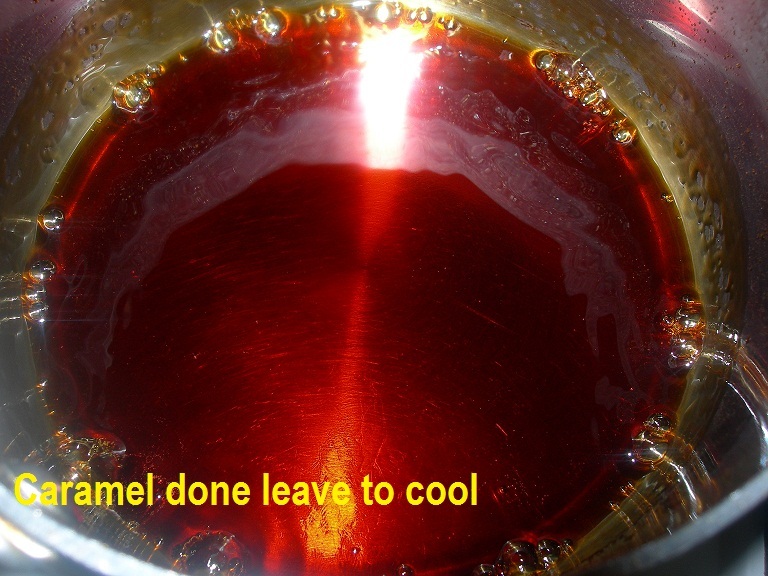 Leave to cool completely. 4. Put the egg whites in a large bowl, sift in the icing sugar, then stir to make a thick, smooth icing. Spoon into a piping bag with a medium nozzle. Pipe generous snakes of icing along the wall edges, one by one, to join the walls together. Use a small bowl to support the walls from the inside, then allow to dry, ideally for a few hours. 5. Once dry, remove the supports and fix the roof panels on. The angle is steep so you may need to hold these on firmly for a few mins until the icing starts to dry. Dry completely, ideally overnight. To decorate, pipe a little icing along the length of 20 mini chocolate fingers and stick these lengthways onto the side walls of the house. Use three, upright, for the door. 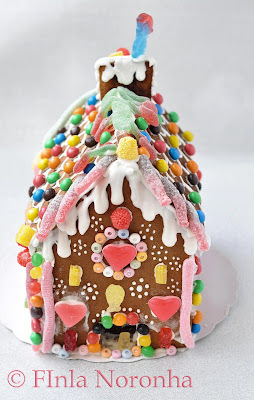 Using the icing, stick sweets around the door and on the front of the house. To make the icicles, start with the nozzle at a 90-degree angle to the roof and squeeze out a pea-sized blob of icing. Keeping the pressure on, pull the nozzle down and then off - the icing will pull away, leaving a pointy trail. Repeat all around the front of the house. Cut the chocolate mini roll or dipped Flake on an angle, then fix with icing to make a chimney. Pipe a little icing around the top. 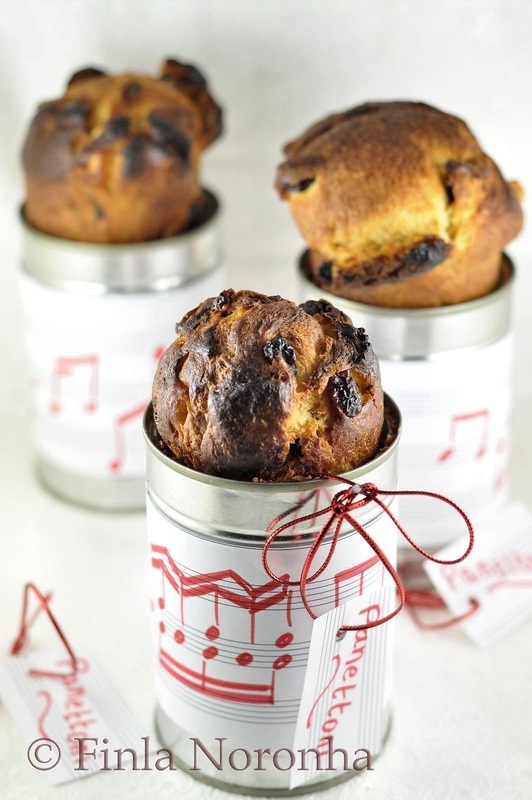 If you've made gingerbread trees, decorate these now, too, topping each with a silver ball, if using. Dust the roof with icing sugar for a snowy effect. Lay a winding path of sweets, and fix gingerbread trees around and about using blobs of icing. 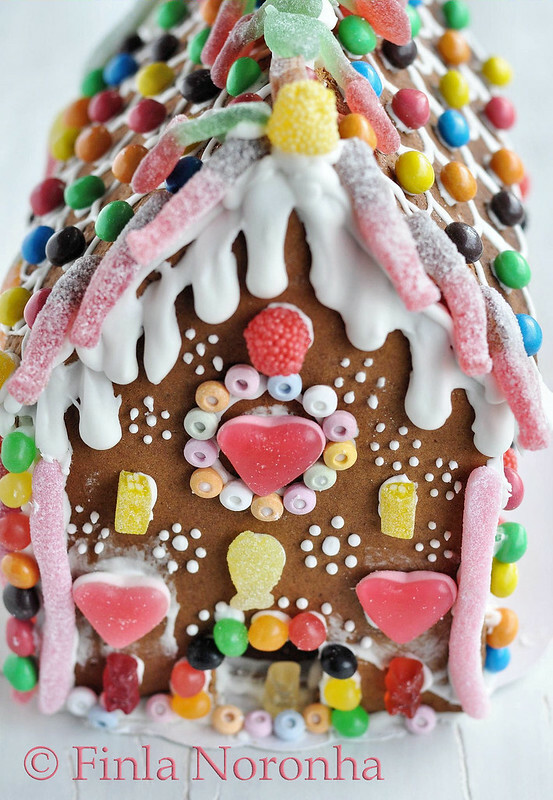 Your gingerbread house will be edible for about a week but will last a lot longer.